The Public Employee Salute is a program the honors public employees for their dedication and service to the state of Utah. Winners of the Public Employee Salute are nominated by a peer or by the public for their hard work serving the citizens of Utah. Each winner is recognized on KSL Radio’s “The Doug Wright Show,” and earns an office work party sponsored by Mountain America Credit Union. In addition, Mountain America and UPEA sponsor a semi-annual luncheon to recognize each winner and present him or her with a certificate signed by Utah Gov. Gary Herbert. Thank you to all of the winners for your dedication to the state of Utah. If you would like to nominate a co-worker please click here. She was honored on March 9th. Nancy Stucki is a Case Manager with the Division of Services for People with Disabilities. For as long as anyone can remember, Nancy has taken a special interest in the disabled community. Each year during the holidays Nancy will purchase, with her own money, a variety of gifts and coordinates with other providers to give them to disabled clients. Her service doesn’t end there, she also volunteers in the community and for her church. Nancy is liked by her clients and maintains relationships for years. If she observes a problem with a past client, Nancy will call their case manager and discuss her concerns. The clients know she genuinely loves them. Nancy identifies solutions, knows the resources in the community, and communicates her knowledge into effective services for everyone’s benefit. He was honored on March 9th. Jordan Wood is a Micro Systems Analyst with the Salt Lake County Health Department. He is the computer IT person everyone counts on to keep things running smoothly. While Health Inspectors are out in the field performing work that is essential to public health, Jordan works behind the scenes to resolve critical IT issues. If he is in the middle of a project he will skip lunch or work late to ensure the IT systems are functioning properly. Jordan has a high degree of integrity, responsibility, and dedication to his co-workers and the citizens of Salt Lake County. His performance is a direct result of his strong work ethic and character. She was honored on March 23rd. Sharon Smalley is a Board Secretary with the Department of Commerce Division of Professional Licensing. Her responsibilities include organizing and overseeing the division’s board meetings. Even though her time is structured around her board duties, she will take the time to assist others with processing applications, sorting mail, or helping other bureaus when they are backlogged. Sharon is not expected to help others, but it is just an example of the type of person she is – Sharon is a shining example of what a good employee is. She was honored on April 6th. Anne Vincent is employed by the Department of Workforce Services as an Employment Counselor. Anne always treats her customers with respect and dignity, even when she may be approached in a rude or hostile manner. She recently took the time to assist a very angry and agitated client by helping determine why his benefits had been terminated. She was able to help the client provide the necessary verification that he needed to retain his benefits. The customer was very demanding; however, Anne maintained her composure, patience, and politeness. Another client that was helped by Anne, brought her flowers when she was able to assist him with a medical application for his family. Anne’s coworkers see her celebrate and grieve with her clients. She invests in them and works diligently on their behalf. She was honored on April 20th. Sandra Osburn is employed by Vocational Rehabilitation in Payson. Sandra is an amazing employee who treats clients with respect and dignity. Recently, Sandra received a telephone call from a suicidal client and was able to help resolve the situation with great care and love. The employees in the office are always receiving compliments from clients about Sandy – from her caring attitude to how she puts them at ease. Sandy also volunteers in her community. Each year she assists a group in donating and decorating a tree for the Festival of Trees, she is involved in Humanitarian work and volunteers at her church. Sandy takes great pride in helping others and the agency is so much better because of her. She was honored on May 4th. Lindy Varney is a licensing specialist for the Utah Division of Wildlife Resources. In her position Lindy is asked to handle some very difficult situations including complaints from hunters and anglers regarding their permits. She assists in allocating special permits and addresses public safety and agriculture conflicts caused by wildlife. Lindy always handles these calls in an appropriate and professional manner, even when the caller is upset or angry. As an avid hunter, Lindy puts herself in the clients’ position and uses her personal experience to resolve difficult situations. She always does her best to represent the interests of DWS and the public. Lindy is a tireless worker and very deserving of the Public Employee Salute. He was honored on May 4th. Dan Trujillo is a Program Development Director with Salt Lake Community College. Part of his job is providing training for students, staff, and corporations. Whenever Dan makes a presentation or conducts a training session, everyone in attendance agrees that he makes it fun, educational, and well worth their time. He recently conducted a workshop for SLCC employees and would not accept payment for his services, even though it was considered one of the best training sessions of the year. Dan is fun, personable, a great training, and has a wealth of knowledge regarding computers and software. He shines in his job and is appreciated by his coworkers, students, and staff at Salt Lake Community College. She was honored on May 18th. LeeAnn is a Disability Specialist with the Department of Workforce Services. LeeAnn is a physically active person who wants to share her desire for a longer healthier life with everyone around her. She serves on numerous committees within DWS including the Wellness Committee. LeAnn uses her positive attitude and encouragement to spear-head healthy activities such as lunchtime workout sessions, a snack shack of healthy snacks, and an hourly plank session throughout the day. LeeAnn has encountered obstacles in the process of creating these activities, but she uses her engaging personality and optimistic view to gently encourage those she works with. She is an example of how little changes can make a big impact. She was honored on June 15th. Courtney Dickinson is an officer for the Department of Corrections and has worked for the state of Utah for 3 years. In this short amount of time, Officer Dickinson has continually shown her fellow coworkers that she will give 100%, no matter what the task is. She is a team player and a great example for any officer. She is able to look at a situation and come up with several alternative solutions to the problem. Not only does Officer Dickinson help train staff at the in-service and pre-service academies, she has rewritten the trainings for the Hostage Taking & Negotiation, Property Processing & Institutional Security classes, and helped rewriting the “On the Job” training manual for new officers starting at the prison. Along with performing regularly required duties, Officer Dickinson actively recruits potential officers, and volunteers at the Draper Days parade and Autism Speaks events. Nancy Lucero is the Office Support for the Food Protection Division of Salt Lake County’s Health Department. For the past 14 years, Nancy Lucero has been the smiling face that greets customers when they enter the Food Protection’s office, and more often than not they leave the office with a smile on their face. Not only can Nancy solve customers’ problems, but she can do this all the while answering telephone calls and emails. Along with being a multi-tasker, Nancy’s high degree of integrity and responsibility keeps the Food Protection’s office running so smoothly. Her hard work and dedication to the Salt Lake County Health Department allows the food inspectors to be successful and do their job to protect public health. She was honored on June 29th. Jennifer Storie is the Special Assistant to Lieutenant Governor Spencer Cox. Jennifer has worked in public service for many years. She began her career in public service as a United States Postal carrier, then worked within the Utah Courts system, which led her to her current position as Special Assistant. Not only has Jennifer assisted with creating bills that have been presented before the Utah House and Senate, but she has also served as the “keeper of the Great Seal of Utah” for all legal documents that bare Utah’s seal. Jennifer’s tireless work ethic and professional demeanor has gained the respect of her coworkers, including the Governor, the Lt. Governor, as well as countless Utah State officials. Jennifer’s commitment to public service does not stop at the end of her work day. In her free time, Jennifer finds time to volunteer with the Utah Museum of Contemporary Art, the local LGBTQ community, and local HRC events. Thank you my fellow public employees for all the great work you accomplish each day. I am proud to work with all of you. Fall has arrived and I hope you had a wonderful summer and were able to spend quality time with family and friends on vacations and family activities. Fall also means election season is upon us. Please take time to get to know the candidates running for public office in your area. The Citizen Action by Public Employees committee has spent numerous hours interviewing many candidates to gauge their feelings about public employees and their needs. After interviews have taken place, the CAPE committee has endorsed many candidates. Look at this listo find the candidates who have earned UPEA’s endorsement because they are friendly toward public employees. Once you know the candidates, take the time to vote. We have all heard that “every vote counts,“ so vote and be counted. I want to give a shout-out and a thank you to the UPEA staff. I attend Advisory Council and State Board meetings and I am impressed with all that they accomplish. We hear about all their travels around the state holding Public Employee Appreciation Days (PEADs) and visiting various worksites. New members have been recruited on each trip, giving UPEA a stronger voice. Also, please continue to tell your co-workers about all the benefits from being a member of UPEA. Each year, the Utah Public Employees’ Association (UPEA) hosts flu shot clinics open to all state employees and their families at various agencies throughout the state. Community Nursing Services (CNS) will administer the clinics this year through November. Flu Mist nasal spray will not be available, only the trivalent flu vaccine. There is no co-payment if you have PEHP health insurance. If you have a different provider, please bring your health insurance card and a photo ID. CNS will bill all insurance providers that it accepts. State employees will only have to pay $25 if CNS does not accept their insurance provider. Please contact UPEA at 801-264-8732 ext. 200 if you have any questions. Click here to view the 2016 flu shot clinic schedule. Great things are happening in the Ogden Valley District. Over the past year, the Ogden district has dramatically improved members’ participation. District meetings have been held at the Ogden Regional Center as well as the Clearfield Department of Workforce Services and have included guest speakers and updates on issues important to UPEA. A Public Employee Appreciation Day (PEAD) Barbecue was held July 19 at the Ogden Regional Center. Several members and non-members attended and had a great time. UPEA staff visited several worksites where employees were working and unable to attend the barbecue to deliver ice cream sandwiches and visit with staff to show appreciation for what they do as public employees. The district offered an additional incentive for new members who joined in the months of June, July, and August. New members’ names were placed in a drawing and the winners received $25 gift cards. “The Ogden Valley District leadership would like to extend a big thank you to all our members for supporting and attending the Public Employee Appreciation Days through this past summer.” Torres said. “We love seeing you and greatly appreciate those who bring their non-member co-workers.” If you have not attended a meeting yet, October is a great month to start. The district meeting will be at the Ogden Regional Center on Oct. 20 from noon to 1 p.m.. A representative of the Ogden Police Department will be the guest speaker. The district also will have its annual holiday party. Additional information will be available at a later date. 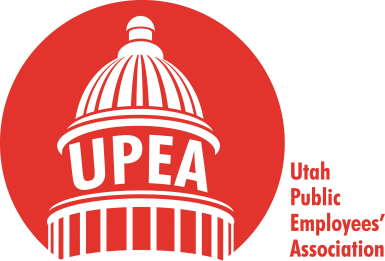 The Utah Public Employees’ Association (UPEA) is operated entirely by its member. Therefore, it is essential that members gather in their districts to elect district leaders to help carry out UPEA’s mission throughout the year. As the weather starts to turn cold, UPEA members should start planning district elections for early 2017. District members should discuss how they are going to hold leadership elections. Elections can occur at a district meeting or by electronic survey. Please plan sufficient time to receive nominations, campaign, and make members aware that elections will take place on a certain date. Please contact your UPEA staff representative to learn about options for conducting district elections. Typically, districts hold their elections in January, February, or March of each year before the annual General Council meeting. Some districts may have Advisory Council seats with terms expiring or Advisory Council members who have served three consecutive terms. Elections for Advisory Council members should also be held. While districts should be planning their elections, UPEA stresses the importance of helping all interested members get involved with their district leadership. Succession planning is important to keep UPEA viable. UPEA encourages district boards to promote rank-and-file members to leadership positions and mentor them. Succession planning will ensure that UPEA maintains fresh ideas to advocate for public employees and help them advance in their careers. Below are the leadership positions available to members within their districts. UPEA encourages current district board members to share these job descriptions and help mentor members to become involved. District Secretary: serves a one-year term. The secretary takes minutes at district and/or chapter meetings, maintains district records, and compiles past meetings minutes. District Treasurer: (may be combined with secretary): serves a one-year term. The treasurer maintains the district financials, provides quarterly reports to the UPEA office, and reports the district’s financial standing at regularly scheduled meetings. District Vice Chair: serves a one-year term unless the district allows the vice chair to succeed to chair. The vice chair assists the district chair in conducting meetings, assembling agendas, and attending district functions. District Chair: serves a one-year term. Assists staff in scheduling district meetings and planning meeting agendas. Conducts district meetings to ensure that meetings follow an agenda, members are recognized during discussions, and members’ votes are counted during regularly scheduled meetings. All district elections should conclude before the start of the 2017 UPEA General Council, which will be held at the University Park Marriott Hotel on March 23 and 24, 2017. 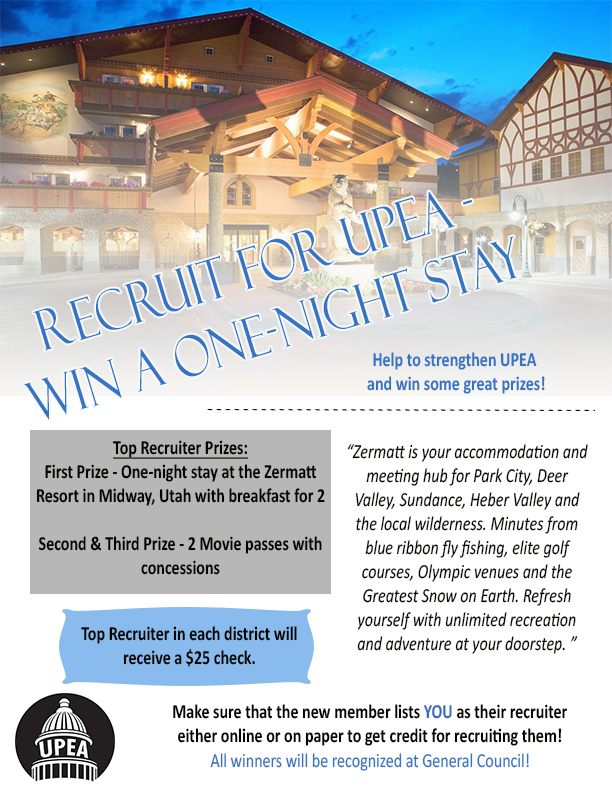 The Utah Public Employees’ Association (UPEA) Membership Services and Public Relations Committee will meet Oct. 27 to randomly draw the winner for the first quarter’s Recruiter Giveaway Program. UPEA members who recruited one or more new members between June and September 2016 will be entered in the drawing. Members will receive one entry for each new member recruited. The committee will randomly draw the second-quarter recruiter in January 2017. If you would like to participate in the program, encourage your co-workers to join UPEA online at https://upea.net/join-today/ and to list you as the recruiter. Both of you also will be eligible for the $20 recruiter and $20 new member incentive. If you’re interested in attending the next Membership Services and Public Relations Committee meeting, please contact Christy Cushing at (801) 264-8732 ext. 218 or christy@upea.net. The Grievance Committee met in August to discuss how members can grieve an annual or quarterly performance evaluation. For there to be grounds to file a grievance, some type of adverse employment action or harm has to occur. Without harm, there is no grievance. An example of harm related to your performance evaluation would be receiving a failed or unsuccessful performance rating. If you feel an aspect or aspects of your performance evaluation criteria is not related to your job requirements, you can provide comments within the Utah Performance Management (UPM) system. However, you will not be able to grieve the performance criteria until after you have failed that particular section of your job expectations, or your overall performance evaluation. The Grievance Committee’s next meeting will be on Oct. 2020 at 6 p.m. at the UPEA office. The committee plans to discuss the Salt Lake County grievance procedure. If you’re interested in attending, please contact Christy Cushing at (801) 264-8732 ext. 218 or christy@upea.net. If you have questions related to the grievance process, please contact your UPEA staff representative. The flu shot season has arrived and CNS will be administering this year’s flu shot clinic with UPEA. There will be no flu mist this year, just the shot. The clinics are open to all state employees and their families. Click here for the 2016 UPEA Flu Shot Schedule.